How great are email polls? Notice how the poll question is the first line, and each of the answers are on a seperate line that starts with an asterisk. 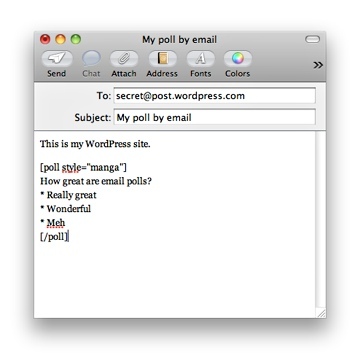 When you’ve sent your email a new post will appear on your WordPress.com blog containing a PollDaddy poll. It couldn’t get much simpler. Full details of using poll by email can be found on the Post by email support page. Hi I tryed this and i poll didnt come up i sent it through email but when it showed up on my site there was no poll just the typing but you couldnt click on it please help i really need a poll. Can you contact support with details of your email. Thanks!